Ex Hot Girl: Who puts the "Work" in Workout? Okay. So this little blog entry is dedicated to the "work" in workout. My Dad tells me that he can see that I work hard on the machines at the gym instead of just leisurely sailing through my 30 minutes. I was on the bike next to another girl today at the gym and she got on about 5 minutes after I did. In 30 minutes I burned 165 calories on the bike, and that was with my not breathing very heavily, just sweating a bit and my legs being pretty sore (from yesterday specifically). I looked over at her screen (does anyone else do this? I'm so bad.) -- and she had burned 70 calories in 30 minutes. I guess I don't really know what my question is. By the by, I'm starting to get really frustrated with my weight loss. I'm so used to seeing the dramatic weight loss numbers on the scale with Atkins, that this eating healthy + working out = almost no change in the scale. I'm sticking around 1200 calories a day, sometimes a tiny bit more, and it's starting to piss me off. 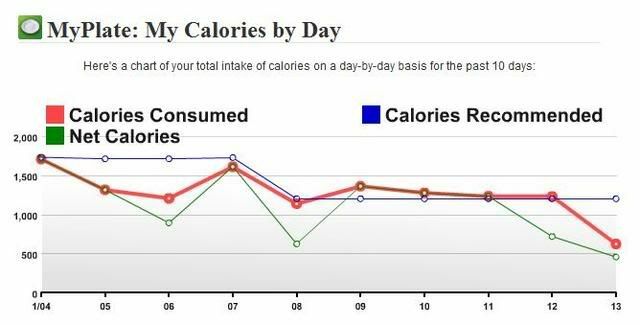 And as a little visual picture, here is my calorie chart for the last 10 days.